Author Stephen Platt is the winner of the 2012 Cundill Prize in History at McGill University for his book Autumn in the Heavenly Kingdom: China, The West, And The Epic Story of The Taiping Civil War (Alfred A. Knopf). The announcement was made at a gala dinner held last night in Montreal. At $75,000 (USD), the Cundill Prize is the largest international literary prize for a work on history. Platt’s winning book describes China in the 1860s as not some exotic, otherworldly “Middle Kingdom” removed from the course of events in the West, but a country deeply integrated into the world’s economy and home to thousands of foreigners. And, as it descended into civil war, the Western powers were watching. The Taiping Rebellion was a conflict with threads that reached around the world – intertwining with, among other events, the simultaneous Civil War in the United States. Its resolution was to a significant degree determined by outsiders. For the West, it proved a dark warning of the perils of involvement in foreign wars and a reminder of just how difficult it can be – in hindsight – to distinguish between humanitarian intervention and imperialism. “All three finalists are, of course, winners of a substantial prize” said Christopher Manfredi, Dean of McGill’s Faculty of Arts, which awards the prize. “We are so appreciative of this year’s Cundill jury members, who tackled a huge task with such respect to the prize. It was important to the jury that the books be accessible to a general audience and they have done a terrific job. “I never intended to become a historian – I was a math major who ended up in the English department – it was only in the course of a two-year teaching position in the Hunan province after college that I began to take a serious interest in how the past and present interweave,” Platt said at the soirée. “As most who practice history know, the truth can indeed be more wondrous than fiction.” Platt is Associate Professor in the Department of History at the University of Massachusetts (Amherst). The two other finalists, Steven Pinker - The Better Angels of our Nature: The Decline of Violence in History and Its Causes (Allen Lane), and Andrew Preston - Sword of the Spirit, Shield of Faith: Religion in American War and Diplomacy (Alfred A. Knopf Canada) were awarded "Recognition of Excellence" prizes of $10,000 (USD) each. The finalists were chosen from 142 eligible submissions, representing publishing houses from around the world. The three finalists were introduced at the awards ceremony by jury member Jeffrey Simpson, The Globe and Mail’s national affairs columnist. In addition to Simpson, this year’s Cundill Jury included Executive Vice-President of Brown-Forman Corporation, Garvin Brown; Charles Kesler, Professor of Government, Claremont McKenna College; and Vanessa Schwartz, Professor in the Department of History at the University of Southern California. 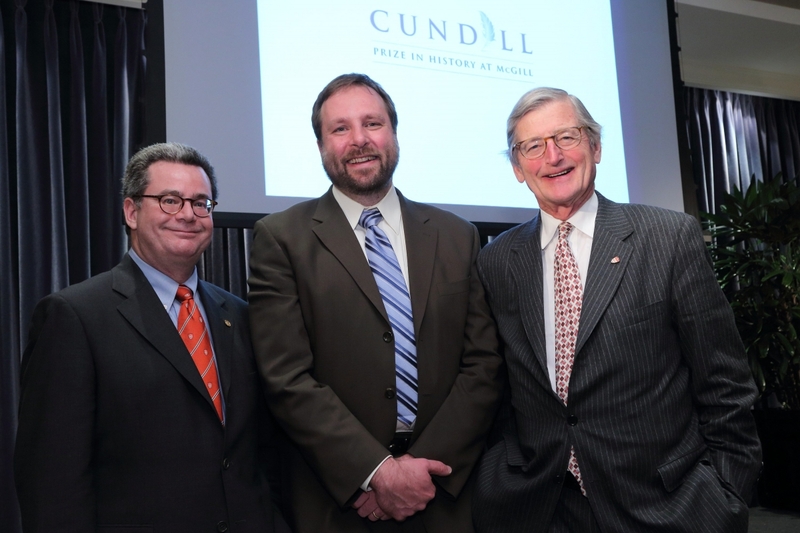 The Cundill Prize in History at McGill is the world’s most important international historical literature prize, with a grand prize of $75,000 (USD) and two ‘recognition of excellence’ prizes of $10,000 (USD). The prize was established in 2008 by McGill alumnus F. Peter Cundill, who passed away in January 2011, and is administered by McGill University's Dean of Arts, with the help of the McGill Institute for the Study of Canada (MISC).